An autographed photo of a young Steve Jobs, signed, "Your man for the Jobs", sold for $915. A vintage 1984 PC Junior invoice, labelled "Aye, here's your BM", sold for $212. The only known paper stock certificates for Microsoft in existence, sold for $24.17 per share. A chair ostensibly stolen from AOL corporate headquarters, sold for an unbelievable $36, fully $8 over and above fair market value. 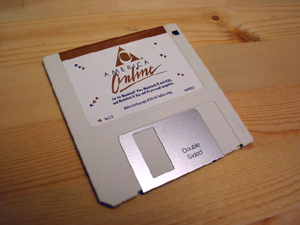 Savvy collectors are strongly encouraged to do as they're able to gather and hoard AOL startup discs, if not for their tremendous current practical value, then for their obvious future value to historians and web weirdos alike. Will AOL Buy Your Blog? Also, check out our complete, up to the minute news roundup, featuring only the finest, freshest news stories from around the globe.